Many thought the election of our first African-American president put an end to the conversation about race in this country, and that America had moved into a post-racial era of equality. Then, on the night of February 26, 2012, a black seventeen-year-old boy walking to a friend’s home was shot and killed by a neighborhood watch coordinator. The July 2013 trial of George Zimmerman for murder captivated the nation, as did his eventual and shocking acquittal. Any belief that we lived in a post-racial America was shattered. Lisa Bloom, who covered the Zimmerman trial from gavel to gavel, posits that none of this was a surprise: Our laws, culture, and blind spots created the conditions that led to Trayvon Martin’s death and made George Zimmerman’s acquittal by far the most likely outcome. A trial lawyer herself, Bloom details how the “winnable case was lost” through new in-depth interviews of key trial participants. The only nonwhite juror tells her story of loneliness and isolation during the trial. The state’s medical examiner describes a scientific theory he wanted to raise during his testimony but could not. Rachel Jeantel, the state’s star witness and the last person to speak to Trayvon Martin, reveals how poorly the state prepared her to testify and what went through her mind when she was on the stand. The Trayvon Martin case was iconic. It forced the country to stare unflinchingly into a family’s grief and the biases of a nation that created the conditions for it. 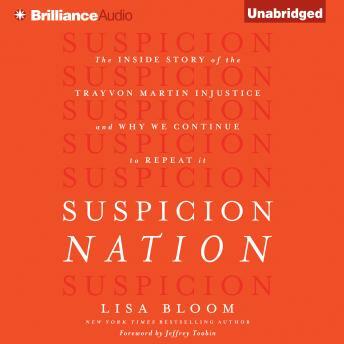 Suspicion Nation expertly captures the state of a country conflicted not only about the Trayvon Martin injustice but divided over issues of race, violence, and gun legislation.